Use Perfect Property to find your next perfect house to buy in Ballsbridge. 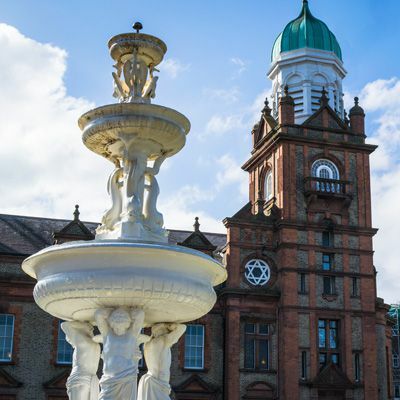 Ballsbridge is a splendid neighbourhood located 3.8km south of Dublin’s city centre. It is about a 16-minute drive by car via the R118 and R138 Motorways. The DART and a number of Dublin Bus routes primarily service the area. Ballsbridge is home to Ailesbury and Shrewsbury Roads, both featured on the board game Monopoly. The lovely Ball’s Bridge spans the River Dodder through Herbert Park. Ballsbridge homes are traditional in architecture, design, and charm. Residences are treated to views of the Grand Canal, leafy terraces, verdant parkland, beautiful shrubbery, mature trees, the quaint Village centre, fantastic acreage, pristine landscaping, and blossoming gardens. Homes retain old-world Period style, and one can expect to find styles of Victorian, Georgian, Tudor, Terraced, Red Brick, Mid-Century, mansion, cottage, modern, and contemporary. New construction and refurbished dwellings are outfitted with modern amenities, luxurious décor, spacious living accommodations, sustainable energy efficiency, and ornate period details. Ballsbridge Village, Baggot Street, and Donnybrook Village are equipped with all conceivable modern efficiencies, including: retail shopping, pharmacies, convenience stores, auto dealers, health care facilities, supermarkets, banking, a post office, and a number of small and large businesses. The neighbourhood has a wealth of delicious restaurants, cafes, delicatessens, coffee shops, pubs, and gourmet eateries. Foodies will enjoy the large selection of delectable cuisine. Ballsbridge is rich in parkland, and offers trails for walking, cycling, picnicking, recreation, and leisure. Nearby attractions include: Aviva Stadium, Herbert Park, St. Stephen’s Green, Merrion Square, and Grand Canal Dock. Ballsbridge is abundant in sporting facilities, including: Pembroke Wanderers Hockey, Old Belvedere Rugby Club, Lansdowne Lawn Tennis Club, Pembroke Cricket Club, and Herbert Park Bowling Club, to name a few. Local Gem: Belucci have a clear goal, to offer the best Italian food in Dublin. This revolves around the idea of not just providing delicious food, but also an enjoyable atmosphere and experience that their guests will want to repeat again and again. There is also an extensive all Italian wine list and is a must-visit in Ballsbridge! Ballsbridge is host to a number of well regarded primary and secondary schools, including St.Brigid’s and St. Conleths. Academic excellence is a top priority, and school awards include: Visual Art Awards, Irish BIM Innovation Awards, and Universal Design Grand Challenge Student Awards. You can filter Ballsbridge properties by price, bedroom size, square footage and more. There is also the option to filter by a property must-have, such as luxury if you are seeking a luxurious house to buy in Ballsbridge, or even high end finishes or newly renovated. You can also check apartments for sale in Ballsbridge if you are looking for something a little smaller. Don't let the perfect apartment, townhouse or house for sale in Ballsbridge get away. Looking to rent in Ballsbridge? Search houses for rent in Ballsbridge and filter by home types, price and size.